We caught Girl In A Coma a few years ago, playing a free show at the great Cactus Music in Houston. The San Antonio-based trio has since become indie/alt darlings of a sort, going on tour with the likes of the Go Gos and the Bangles and opening shows for Joan Jett and the Blackhearts. There’s no denying the charisma of singer/guitarist Nina Diaz, who combines beauty and punk like nobody else – while drummer Phanie Diaz (Nina’s sister) and bassist Jenn Alva lay down a wicked rhythm. Girl In A Coma’s latest album Exits & All The Rest recently picked up an Independent Music Award for Best Indie/Alt Rock Album, so there you go. This is “Smart,” from that album. Girl In A Coma is on the bill this weekend at the Free Press Summer Fest in Houston. Among the other acts appearing will be Snoop Dogg, Willie Nelson, the Avett Brothers, Primus, Best Coast, Morris Day and the Time, and many more. There are still tickets left although they have to be close to selling out by now; 75 bucks will get you in both days. Check out the full lineup and ticket info here. We’re big fans of Tom Morello, best known as the guitarist for Rage Against The Machine. With Rage on indefinite hiatus, Morello has turned up in various incarnations: as part of Street Sweeper Social Club with rapper Boots Riley, and as the Nightwatchman. Today is Tom’s birthday – happy birthday, Tom! During SXSW a few months ago we were lucky to catch a Morello/Nightwatchman show, up close and personal at Threadgill’s beer garden. Morello performed a sizzling version of Bruce Springsteen’s “Ghost of Tom Joad.” He went on to play it again, with the Boss later that night – but here is Tom’s solo version. Bonus: At the end of the show, Morello invited everyone in the audience to join him onstage for the finale, a singalong version of “World Wide Rebel Songs.” We all jumped onstage with him – you can see us doing just that right at the beginning of this video – and sang like crazy people. Thanks to 50174 for the videos! Don’t know if you’ve ever heard of the rock band Primus … they’re a band that’s really out there. Primus is a trio led by singer/bassist Les Claypool, and he’s backed by drummer Jay Lane and guitarist Larry “Ler” LaLonde. Primus is one of the headliners this weekend at the Free Press Summer Fest in Houston. Among the other acts appearing will be Snoop Dogg, Willie Nelson, the Avett Brothers, Morris Day and the Time, and many more. Unbelievably, there are still tickets left (unlike that big, overbloated summer festival down the road in Austin) and 75 bucks will get you in both days. Check out the full lineup and ticket info here. 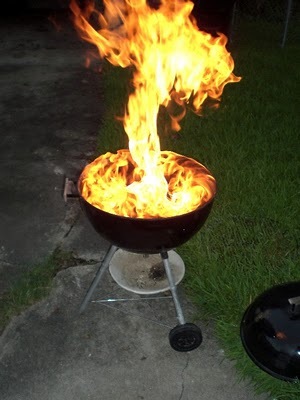 Backyard Fireball: Memorial Day Grillin’! The big Memorial Day weekend is here and we want to know: what are you grillin’ this holiday? Here in Texas barbecue is a religion, like football and drivin’ fast. Barbecue is sittin’ on the patio, a Weber grill smokin’ some ribs while you listen to rock and roll and swig a cold beer. Barbecue is more than just tossing some wieners on a fire. It’s smoking a succulent side of beef, making sure those pork ribs are just right, and poking a fork in a chicken thigh to make sure the juices run clear. It’s real cookin’! It’s also potato salad, watermelon, beans in barbecue sauce, potato chips, Big Red soft drinks and lots of cold, cold beer. You got all that, all you need is some fine music. From 1975 or so: Bob Dylan performing “Tangled Up In Blue” in white face. Why? If you don’t know, don’t ask me – I don’t know either. This is probably from the 1978 movie Renaldo and Clara (if you don’t know why, don’t ask me … etc.). Today, Bob Dylan is 71 years old. Happy birthday, Bob! I have a birthday present for you, it’s a song title! “If You Don’t Know, Don’t Ask Me. I Don’t Know Either.” Now you gotta write the song! “Rocky Ground” is the moody new video from Bruce Springsteen’s Wrecking Ball album. Black Sabbath is back – almost. Earlier this year the original lineup of Ozzy Osbourne, Tony Iommi, Geezer Butler and Bill Ward announced they would be making a new album and touring this year. However, guitarist Iommi was diagnosed with lymphoma for which he’s required treatment and drummer Ward has stayed away due to contractual issues. So they’ve drastically scaled back any touring plans. Instead of a full-fledged Sabbath tour, people in Europe are going to get a few dates and the group – with replacement drummer Tommy Clufetos – will make its only North America appearance this year at Lollapalooza, in Chicago. Gearing up for an appearance June 10 at the U.K. Download Festival, Sabbath played a warmup show recently at the O2 Academy in Birmingham, England. Here’s “Iron Man” from that show. You are currently browsing the 30 Days Out blog archives for May, 2012.